Today’s post comes from Who’s Who: The Definitive Directory of the DC Universe #3 (May 1985). 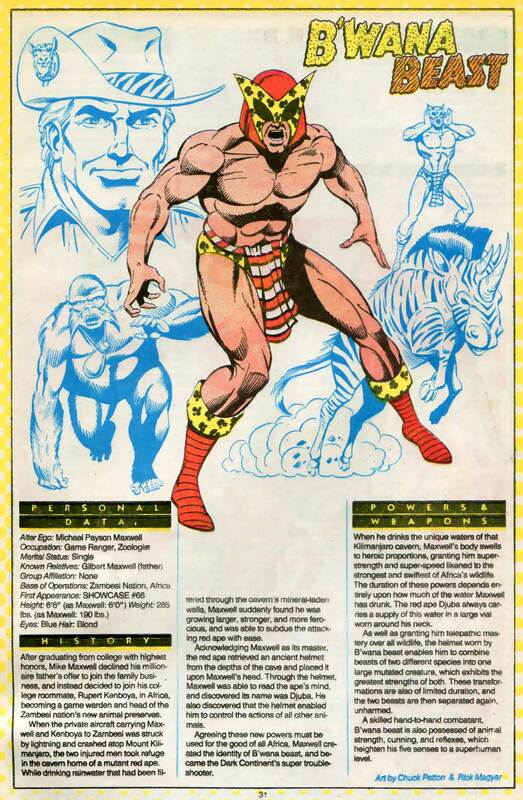 This was the first Who’s Who series and was the third appearance of B’wana Beast. The art in the entry below is by Chuck Patton and Rick Magyar. Such a great iconic image of the character! This particular issue of Who’s Who was published just before B’wana Beast’s appearance in Crisis on Infinite Earths, so information presented was current to that point. If you are interested in reading the text, click the image for a larger version. ← B’wana Beast gets animated! i used to have this issue of Who’s Who. that was my first look at B’Wanna Beast but outside of that and a JLU episode called “This Little Piggy” i don’t know anything about the character. but i certainly understand your reasons for the switch over from the Firestorm blog. i like how in the Who’s Who Powers & Weapons section of the character how it describes his body as “swelling to heroic proportions” when he drinks the cavern waters of Kilimanjaro. i think there’s at least a couple of companies that make pills that pretty much do the same thing.